Char Dham Yatra can be a great explanation to enjoy the thrills of a helicopter ride since the high altitudes are usually negotiated through these flying machines. Still your kids would be in love with the excitement such a ride assures. The Helicopter service is simple manner to take the air trip abode to the shrines and sacred places in Badrinath, Kedarnath, Gangotri and Yamunotri. For the Hindu devotees, mainly those who journey from across the seas to be the part of yearly holy group do not have a lot of time in their hands, and thus, yatra by helicopter is their ideal alternative by all the means. Chardham Tourism offers Chardham Yatra by Air booking services for 2019. We are faithful to offer following facilities throughout Chardham Yatra by Air, but in the Himalaya weather is bad, then flight plan may be affected. Chardham Tourism is the budget tour planner for Chardham Tour. We have complete Chardham Tour Packages for every one as Chardham Dham Bus Tour, Chardham Yatra, Chardham by Helicopter Tour and lots more. Helicopter service to Chardham activates from the helipad at Sahastradhara, Dehradun in the Uttarakhand state of India. 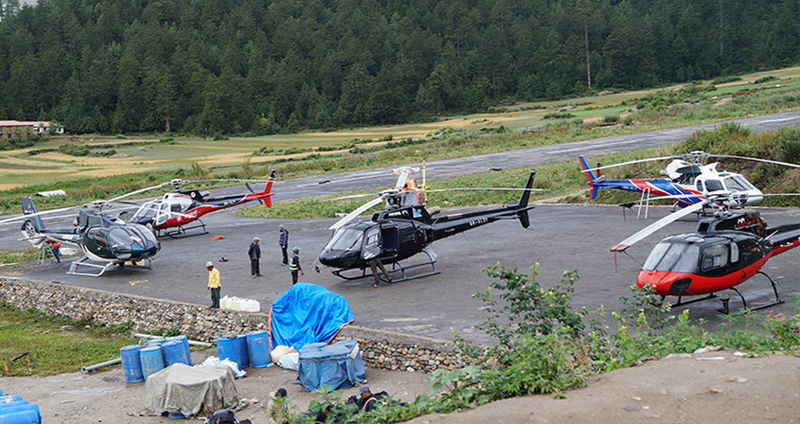 Chardham helicopter would depart at a likely time of leaving of 6:30 hrs from the Sahastradhara Helipad at Dehradun. Journey by helicopter, it takes approx 50 minutes to 1 hour each way. After refrshment start 06 km Yamunotri trek by pony or palki. And Make Maa Yamunotri Darshan and back to Helipad. Transfer by taxi Helipad to Hotel and after the refreshment drive for Gangotri Temple (25 Kms. by ROAD Tourist Cab will be provided) Maa Ganga VIP PUJA and Darshan, Back to Hotel. (Helipad to Temple 2 Kms distance. by ROAD; Taxi will be provided) Badrinath to Haridwar / Dehradun by Helicopter.